RSA Insurance Group was the first insurance company to join the UKVI Portfolio back in 2012 and it has been a mostly disappointing – although not catastrophically bad – investment. This investment review covers why RSA was added to the UKVI Portfolio, what went wrong, why it’s being sold now and how this investment has helped improve the underlying investment methodology. In January 2012 RSA appeared to have turned itself around after a problematic period in the early 2000s, which included a dividend cut and rights issue to strengthen the balance sheet. When I reviewed the company its dividend yield was 8.8%, so clearly the market was pricing the shares as if a dividend cut was inevitable. In this case the market was right because the dividend was subsequently cut, the CEO “resigned” and a rights issue was carried out. However, thanks to recent acquisition interest from Zurich Insurance RSA’s share price has reached a point where this particular value trap can now be escaped profitably. I was well aware of the risks of investing in a company with such a high yield, but I rationalised the risks by thinking that even if the dividend was cut in half the yield would still be above the market average. In other words, I thought the risks were already accounted for in the price. On the plus side, if the dividend wasn’t cut, or was only cut very slightly, then the shares were likely to re-rate upwards, producing large and rapid capital gains. 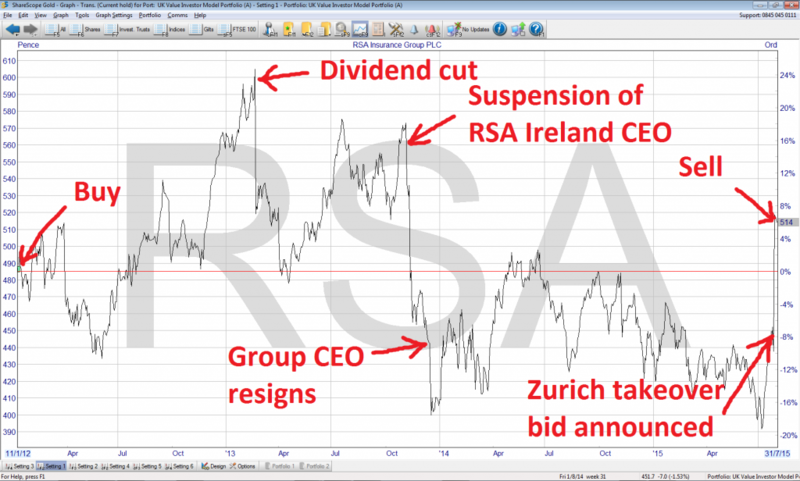 The chart below shows RSA’s latest financial results at the time of purchase in January 2012 (up to the 2010 annual results). “In very simple terms insurance companies can make money in two ways: one is to make money on each policy so that the premium income more than offsets any losses; the other is to invest that premium while it’s held in reserve waiting to cover any losses. If this ‘float’ is invested well it makes money which goes on the bottom line. So the company had a history of recent failures of judgement, but it seemed that things had gotten better and none of the metrics I used in 2012 told me otherwise. After analysing the company I was comfortable investing 3% of the UKVI Portfolio into RSA and a similar amount with my personal investments. Unfortunately RSA did still have underlying problems which needed sorting out, and these were pretty much the same issues it had exhibited during the 2000 – 2003 period. Investors were hit with wave after wave of bad news, including a major dividend cut, a resigning CEO and a significant rights issue. I’ll start with the dividend cut, which was announced in the 2012 annual results, published in February 2013, where the main reason given for the dividend cut was exceptionally low bond yields. At the time RSA had more than £11bn of its customers’ premiums invested in bonds and was clearly relying on returns from bonds and other investments to fund a portion of its dividend. This is normal for an insurance company, but it does perhaps hint at RSA’s inability to generate significant cash from its underwriting (i.e. insurance) activities rather than its investment activities. As usual I did not sell when the dividend cut was announced. In general I think there are better opportunities to sell than immediately after a dividend cut. Dividend cuts often result in new management taking over, changes being made and companies being improved. At some point down the line some good news is likely to appear and the market will hopefully raise the share price accordingly. In RSA’s case, Stephen Hester (of RBS turnaround fame) joined the company in 2014 to turn things around. By holding on I was effectively waiting for that turnaround to come good, or at least for the market to think the turnaround would come good and therefore raise the share price to where I could sell the company for a decent profit. However, I would have preferred to avoid this value trap altogether and, with hindsight, I think RSA’s problems were visible beforehand if I’d known where to look. RSA’s first problem was weak profitability. One of the ratios I now apply to insurance companies (which I didn’t in 2012) is the Combined Ratio, which works a bit like profit margin. It is a combination of the Loss Ratio (the ratio between claim expenses and premium income) and the Expenses Ratio (the ratio between operating expenses and premium income). In the 5 years to RSA’s 2010 annual results (the latest results available when I reviewed the company in January 2012) it had a 5-year average Combined Ratio of 94.7%, which means it would have just about passed that test if I had been using it. So while RSA’s profitability was weak, it was not weak enough to make me avoid the company, even with hindsight. However, when the 2011 results were published in February 2012, shortly after I’d bought RSA, its average Combined Ratio crept up to 95.1%, just fractionally outside my minimum profitability. When the 2012 results were announced a year later (along with the dividend cut) its average Combined Ratio rose to 95.2%, which is clearly going in the wrong direction. So the company’s profitability was weak at the time of purchase, and getting weaker. It was a definite warning sign that the company lacked a meaningful competitive advantage. I now use a range of different metrics for measuring leverage, but for insurance companies an important measure of operating leverage is the Premium to Surplus Ratio. This is the ratio between how much premium a company writes in a given period and how much “surplus” assets the company has over its liabilities. The idea is that an insurance company has a fiduciary duty to pay out claims and so if push came to shove all of its assets should be sold in order to fund its claim liabilities. The size of the surplus then dictates, approximately, the maximum amount of new business the company should write, as there is only so much new insurance business a company should take on given its ability to pay existing claims. This is an old insurance industry rule of thumb which has stood the test of time as an indication of prudent underwriting activities. In 2010 RSA wrote premiums of £7,455m and had tangible shareholder equity (tangible assets minus liabilities) of £2,557m, giving the company a Premium to Surplus Ratio of 2.9. This is clearly above my “rule of thumb” maximum of 2. If I had looked at the Premium to Surplus Ratio in 2012 I would have seen that RSA was taking on lots of new business relative to its asset surplus. Another way of looking at it is to say that RSA’s asset surplus was too thin for the amount of business it was writing. 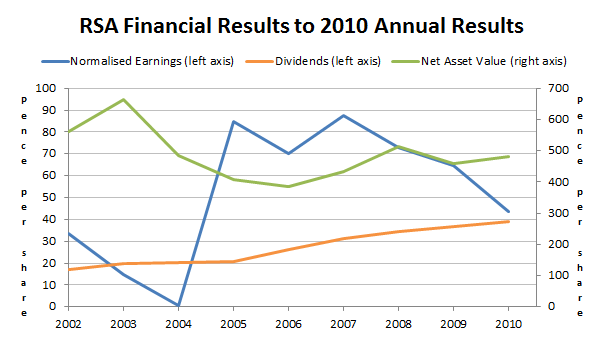 After the 2011 results, RSA’s Premium to Surplus Ratio increased to 3.3 and in 2012 it increased to 3.7. Clearly RSA’s margin of safety was becoming ever more thin in relation to the amount of insurance it was writing. This could not go on forever, and at some point premiums written would need to be reduced or capital would have to be raised in order to boost the surplus, or both. Unfortunately for investors, dividend cuts and rights issues are the primary means for boosting the capital surplus and that’s exactly what RSA did. I do not like to sell on bad news. I prefer to sell when everybody is optimistic about the future of a company. In the case of an underperforming company like RSA, that usually means waiting for some hint that the turnaround is going well, and that is essentially why RSA was still in the portfolio even though for a long time it was one of the least attractive holdings. However, Zurich Insurance is apparently now interested in buying RSA for something in the region of 550p per share, if rumours are to be believed. This boosted the share price to 525p on Wednesday, which is higher than it had been since 2013. For me this means optimism for RSA has returned and any operational improvements from the turnaround are already largely included in that price. After this recent price increase RSA had by far the lowest rank on the UKVI Stock Screen of any holding. It is not a company I particularly want to keep in the portfolio and so I have taken this opportune moment to offload RSA at a point where the investment’s total annualised returns are a somewhat weak but not horrendous 5.8% per year over 3 years and 6 months. RSA has not been the most profitable of investments, but it has been profitable in terms of lessons learned. Thanks to RSA I expect to only invest in much better insurance companies in future. 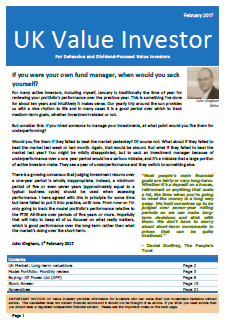 Note: You can read the full pre-purchase review of RSA by downloading the January 2012 issue of UK Value Investor (or the Defensive Value Investor as it was known back then). I am interested by your new rule of thumb for insurance companies. An average combined ratio of 95% or less over the last five years. Oddly, I have not used the combined ratio in that averaged sense before which seems a silly error. But, we live and we learn! Thanks again. Great post. Glad you managed to get out at a pretty solid price in the end. Hi DD, when I bought RSA I didn’t really have a good way of understanding insurance companies, so RSA was partly a learning exercise. I think it’s absolutely critical for investors to know how to improve their investment abilities and for me, taking small-ish positions in companies you don’t really understand is a great way to do it. The “knowledge dividend” can be massive and I fully expect to buy much better insurance companies now that I’ve developed a set of appropriate metrics. So you saying “we live and learn” is exactly right, we live, learn and hopefully share with others what we have learned. I think the idea that you always manage to exit a bad investment at a profit is a bit of spin and PR for UK Value investor. Sometimes there is no offer and a bad investment can languish for years. You pay an opportunity cost in waiting for a takeover that might never happen. The market doesn’t care what you paid for your shares so think about it. If it was generally right to hang on then the best investment strategy would be a fund which bought the worst stocks in your screen and waited for a random event to get out at a profit. Only its not. So clearly the logical position is take a loss and move on. Hi Andrew, thanks for your comment. I certainly wouldn’t say I always manage to exit a bad investment profitably. You only have to look at the review of my investment in Serco to see that. You’re right though, sometimes a company turns bad and there is no recovery, ever, and there is an opportunity cost in waiting. But on average I think waiting is the right thing to do rather than immediately taking a loss on bad news. I don’t really agree with your second paragraph. I’m not saying the best thing is to buy bad companies and wait for a turnaround (although for some that is a valid investment approach), I’m just saying that if you happen to end up invested in an underperforming company then waiting for good new is, I think, probably the best thing to do. It won’t always work but, on average, it does more often than it doesn’t. I think you are missing the point here. I am saying that there is nothing wrong in taking a loss. All things being equal and you had the money invested in a loser in your hand would you rather put it into a winner. ie one of your highest rated companies or back into the loser? If the answer is into the higher rated company then on average you are better selling out and taking the loss. Of course its painful to do that and I have had to take losses myself but often your best loss is your first loss. Pyschologically its better to hang on in the hope of good news but your are contradicting your own rankings if you do so. Its clearly not on average the best thing or the stock you are hanging on for would be higher in the rankings. 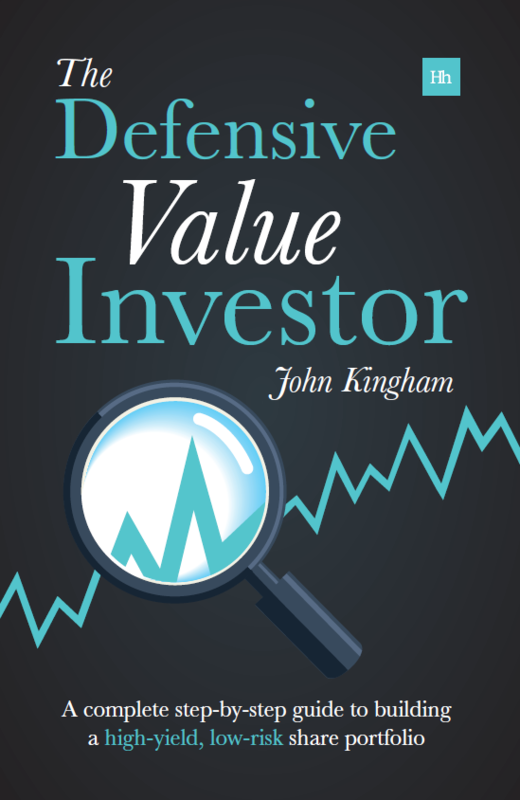 John, you don’t seem to have explained why, now that the Hester turnaround has made the investment positive, RSA might not go forward to even better things – you simply say that you don’t particularly want to keep it in the portfolio, but may look for other insurance companies to invest in. Hi Ranald, okay thanks for letting me know I wasn’t clear enough. My general position is that I don’t like to speculate about whether a particular company will or won’t do well in the future as such speculation very often turns out to be wrong (and that’s generally true across all investors, not just myself). So in this case RSA may well turn around and do fantastically well, or it may not. I really have no idea and neither does anybody else, in my opinion. Rather than speculate about the details of RSA’s future, I prefer to look at its past and judge it on its historic operational performance and current share price. Given it’s pretty mediocre (at best) recent history, i.e. the last decade or so, I think that the current price is not particularly attractive, assuming that its future looks something like its past, i.e. mediocre. There are, for example, more profitable, faster growing, more consistent companies available at lower valuation multiples, and it is in those companies that I would rather be invested. These factors are reflected in RSA’s weak stock screen rank, and perhaps 80% of my decision to buy or sell a particular company is driven by that rank. RSA’s rank was by far the weakest in the UKVI Portfolio, there were no compelling reasons to keep it in the portfolio (such as a high dividend yield, an obviously impending growth spurt or turnaround in market sentiment, etc) so therefore I decided to sell it in order to reinvest in a better, more attractively valued company. I’m not actively going to look for another insurance company to invest in, but if one turns up that looks attractive I feel that I have a better set of tools for analysing it compared to those I had in 2012. I hope that makes my position somewhat clearer. If not then send me an email and I’ll go into more detail. And in the end you have been lucky, Zurich deciding today not to buy RSA in the end. If I get 30 minutes today, I may try to understand the facts about RSA, it may be the stock is oversold now. Hi Eugen, yes lucky indeed. Luck is an important aspect of investing and I’ll take it where I can!